Do you think Obamacare is good for America? Or do you prefer to the Affordable Care Act? Yes, you caught it. They're the same thing. But not everyone makes that connection. When many Americans cannot name their own Vice President's name it is not surprising to hear a 2013 Gallup poll found 45% of Americans approved of the "Affordable Care Act," whereas only 38% approved of "Obamacare." "The Patient Protection and Affordable Care Act," or Affordable Care Act for short, is the name that the President himself generally uses for the law. Others prefer the (admittedly catchier) term "Obamacare." Opponants of the act used this title pejoratively early on in the 2012 campaign in an effort to tie Obama's election fate to the controversial health care initiate. Obama later started to embrace the term himself. Online news source The Wire credited the first recorded usage of the term to none other than Mitt Romney. He used the word in May of 2007, along with the similar phrase "Hillary-Care." However it originated, the title "Obamacare" seems here to stay. What do you think the history books will say about this policy? And what will they call it? Personally, I think the people who can't distinguish between the two names shouldn't even be voting if they're that misinformed... But regardless, I agree with Obamacare and it's already happening whether people like it or not, but I believe it will improve general healthcare. I agree, that regardless if people approve or disapprove, it has gone through congress, and has been passed. It will just take time to see the results, good or bad, that Obamacare has on America. I think that if you can not realize that these two acts are the same thing, then you shouldn't be voting. But Obamacare has to have some positive effect if Obama got elected a second time. It will be eternally known as Obamacare. If it works, President Obama will be remembered for the success of Obamacare. If it fails, they will make a connotation his name with legislative failure. When Obamacare seems like a success, the administration praises the term Obamacare, but when it seems to fail, they use the Affordable Care Act (ACA). 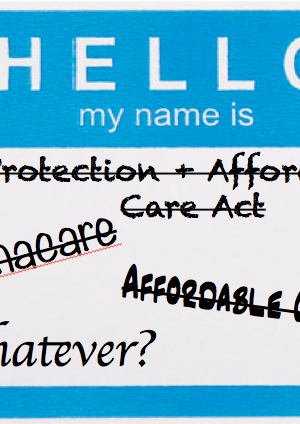 In official reports, and history books, it will be known as the Affordable Care Act (a.k.a. Obamacare). Whether it succeeds or fails will determine what it is called, and by whom. A certain name can be trademarked, but to nit pick who said what first rather than acting on it is ridiculous. So what "Hilary-care" was coined phrase because clearly that doesn't matter today when Obamacare shadows over that. Your right in my opinion i think that people will always come up with a different name for the same things. A lot of people hate Obama Care. I could care less about how people think of Obama care. In the future people will go back and half will probably like It and more would probably criticize how Obama ran the country. I think that a lot of people don't realize that they are the same thing and they need to know that before they vote on anything. History books will call this the affordable healthcare act but in parentheses will put(also known as (Obamacare). The book will say whether or not it worked in the long run and that a lot of people opposed it the entire time. I kind of think that this time period will make historians scratch their heads, especially at this. It will probably be something that everyone at the end of the day will laugh at and think it is stupid that a name really has that much of a percentage difference. I think they will call it the more popular one though because as i said it is more popular and more people will realize that. I think people need to realize that they're both basically the same. I think this demonstrates the number of Americans who vote without being informed and knowledgeable. People need to know the name of things that they talk about. This is obvious. I believe that everyone in America deserves healthcare. Call me crazy, but I actually like socialist ideas that call for higher taxes, but people receive benefits like universal health care and higher education. The fact that so many Americans go into debt each year because of health care costs, is rediculous. You can't expect someone making minimum wage to pay for a $100,000 or more procedure. It's just not going to happen. I do wish for universal health care in America, I just don't know if Obamacare is the answer. I think that like every other things now a days have been given a "slang Term" as just another name for it. And that some people will always come up with different names for the same things such as "pop" or Soda Pop".